I want to extend a heartfelt congratulations to my friend, Ellen Johnson Sirleaf, for receiving the 2017 Ibrahim Prize for Achievement in African Leadership. 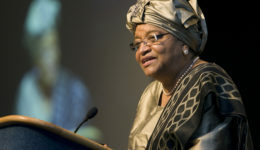 Throughout her 11 years of service as the President of Liberia, Ms. Sirleaf demonstrated an unrelenting commitment to the prosperity of her constituents and strengthening of democratic institutions—leading the country through a time of restoration after a debilitating civil war. I look forward to continuing to work alongside Ms. Sirleaf as she champions efforts to achieve the UN goals for sustainable development, including the fight against malaria as a member of the End Malaria Council.